From the start the institute has done this exceedingly well with the appointment of its first director Professor Katharine Ellis, then Professor John Irving, and, at present, Professor Paul Archbold. (The latter’s secondment from Kingston University ends 31 July 2014; applications for the new full-time post as director are invited, though see below.) Since 2005 Valerie James has served as manager, since 2010 responsible for a combined administrative office serving the IMR, the Institute of Philosophy, and the Institute of Germanic and Romance Studies. Even if you have never heard of the IMR, chances are good you have participated in a conference supported by it or know a colleague who has. 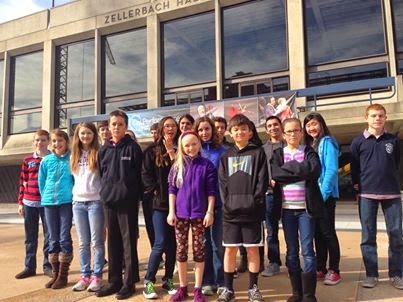 One of these might be the 4th Annual Conference of the Royal Musical Association Music and Philosophy Study Group (in collaboration with the Music and Philosophy Study Group of the American Musicological Society) forthcoming in late June 2014. During its history, the IMR has financially supported the collection and submission of details of UK publications to RILM, Répertoire International de Littérature Musicale. The institute also maintains ten research networks, a great many of which overlap with performance, as is the case with the SongArt Performance Research Group and DeNOTE. (The latter bringing together scholars and practitioners in the field of eighteenth-century music.) Both have produced videos; see HERE and HERE.) A recent publication of an IMR supported conference includes the 354-page The Impact of Nazism on Twentieth-Century Music, edited by Erik Levi (Vienna: Böhlau, 2014). The IMR has been in the news lately, and that news is worrying. 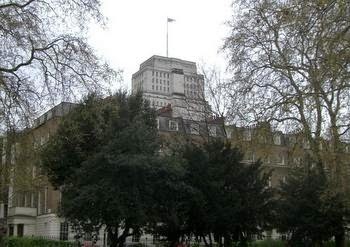 An article by Matthew Reisz in the 17 May 2014 Times Higher Education carried the headline “University of London ‘plans closure’ of Institute of English Studies” (IES). One also learns that the “financially fragile” IMR likely will find itself merging with one or more SAS institutes. Given the IMR’s sponsorship or hosting of numerous conferences each year, and its ties to the American Musicological Society’s United Kingdom sister organization, the Royal Musical Association, the institute’s future ought to concern all readers of Musicology Now and AMS members. Thanks are certainly due Professors Kain and Sir Adrian Smith. They need to be encouraged, too, to fill both positions and to maintain the IMR. Their e-mail addresses are roger.kain@sas.ac.uk and adrian.smith@london.ac.uk. James Parsons is Professor of Music History at Missouri State University. His work focuses on German song from the eighteenth to the twentieth century and Beethoven. He edited and contributed two essays to The Cambridge Companion to the Lied (Cambridge UP, 2004). NOTE: as part of our ongoing series on professional activity in musicology, we asked Sandy Wilbur to summarize her work. As a forensic musicologist, I have a wide variety of projects, potential or ongoing music litigations, public domain research, preventative problem solving (avoiding infringement issues when using reference tracks in films, for instance), and tracking down the origins of songs. One of my favorite projects was working with the Coen Brothers and T Bone Burnett on the songs used in O Brother Where Art Thou, which won a Grammy for best album of the year in 2002. The Coen Brothers had built their entire script on songs that they assumed were “traditional” because that is what the CDs they bought stated. But that was hardly correct. After a year and a half researching field recordings in the Library of Congress and consulting experts, I discovered that some songs published for years were really in the public domain while another assumed to be traditional had been created in the 1950s. There were many original arrangements of public domain songs, and I had to determine which of these arrangements was closest to the one used. The version of “Man of Constant Sorrow” used in the film, was a version that was very different from the one many of us knew. This one, however, had not been copyrighted. It was used in the film. The research paid off. There were no claims made against any of these wonderful songs. 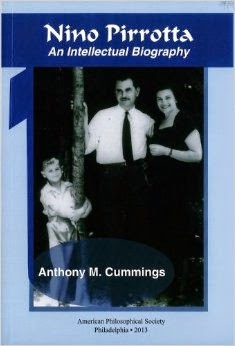 NOTE: Anthony Cummings's intellectual biography of the distinguished musicologist Nino Pirrotta (1908–98) won the 2013 John Frederick Lewis Award from the American Philosophical Society for the best book published by that organization during the year. Here are some lightly adapted excerpts chosen by Prof. Cummings. An accurate and illuminating word picture of Nino Pirrotta would be a complex and richly colored one. He was dignified and aristocratic in manner and on occasion could appear severe, but was never actually so. On the contrary, he was warm, gracious, humane, generous-spirited, modest to the point of self-deprecation, whimsical, verbally playful, and appreciative of life’s ironies. His manner was serene and reserved, and he seemed continually absorbed in reflection. But he was also adventurous, courageous, and open to opportunity, both personal and professional. Deeply and broadly learned, he was exacting in his mastery of the pertinent source data and impressively in command of the findings and methodologies of more than one established discipline. ... He also inclined toward the judicious exercise of insight and intuition; he was intellectually refined and Apollonian in his sensibilities, and his historical imagination was vivid and fertile. How did Nino Pirrotta come by such qualities of intellect and character? His intellectual sensibilities were a consequence to some degree of his early family life. Pirrotta’s parents and grandparents were members of the Palermitan upper middle class, which afforded him material advantages; he benefited from his family’s cultural interests and activities; and he profited from the vital artistic and intellectual life of early-twentieth-century Palermo. Pirrotta’s paternal grandmother Giulia was the daughter of Felice Pirandello. Her first cousin Stefano was the father of Luigi Pirandello, the 1934 Nobel laureate in literature and one of the most celebrated literary figures of the twentieth century. Nino Pirrotta [was thus] his second cousin once removed. His education consisted largely of training in Latin and Greek languages and literatures, Italian language and literature, and history. ... It was very much an education designed for a tiny social, economic, cultural, and intellectual elite, at a moment in Italian history when almost 100% of Sicilians and some 95% of Italians generally were effectively illiterate. Nino Pirrotta’s intellectual profile is to be understood as a synthesis of the practices and traditions of the conservatory and the university. The absence of an opportunity to study music history at the university when he was a student compelled—indeed, liberated—him to develop a personal vision of the discipline based directly upon his experiences as conservatory licentiate in history of music and diplomate in organ and organ composition, and university laureate in art history: he applied the rigorous scholarly methods of art history as practiced at Florence to the primary materials of music history. His two-volume thesis, 31 October 1931, is entitled Fonti iconografiche e stilistiche della pittura su maioliche del Rinascimento (“Iconographic and Stylistic Sources of the Painting on Renaissance Maiolica”). Music history as then taught at the Italian conservatory was not only limited in scale, but also designed with an applied objective in mind: to provide composers and performers with a (rudimentary) understanding of historical context. 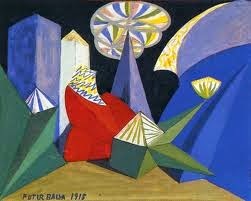 Pirrotta’s studies in art history at the University helped him develop a more intellectually-refined sensibility. He came to appreciate that besides its utilitarian, applied value, the history of the arts was also intrinsically meritorious, in intellectual terms, in its own right. Understanding the innate intellectual viability of the history of the arts was critical to the development of his authorial voice and vision of music history as a fully legitimate university discipline. ... A northern Italian (even Germanic) philologistic, Positivistic, fact-drenched epistemology is tempered with a southern Italian (even Sicilian) Spiritualist, Idealist, intuitive epistemology. As early as Il Sacchetti e la tecnica musicale del trecento italiano (“[Franco] Sacchetti and Musical Technique in 14th-century Italy,” 1935, with Ettore Li Gotti), Pirrotta reveals what will become his signature approach as an historical-musicologist. While fulfilling his obligations as a “Positivist” paleographer—he accompanies transcriptions of the music and musical analyses with a detailed critical apparatus—he declines to limit his engagement with the material in that way, to abstract the music from its setting(s). Rather, the paleography is merely preparatory to the ultimate objective: a full and revealing re-situating of the music, its re-location within ramified contexts, whether philosophical, literary, social, or intellectual. His writings leave his readers with an enhanced understanding of the place of music in the culture of which it is an oft-elusive expression. ... He created his own independent vision of the fledgling discipline of historical musicology, one that relinquished pride of place to neither of the two underlying academic traditions, but, rather, amalgamated the musical microcosmic and the historical/contextual macrocosmic into an illuminating synthesis. The Roman years were extremely productive for Pirrotta’s scholarship. ... Rome had a wealth of sources for other phases of the history of Italian music, and Pirrotta took advantage of them to inaugurate his series of studies of the origins and early development of that most characteristic of Italian musical genres, the opera. 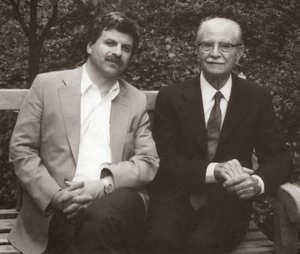 It was during his Harvard years (1956–72) that Pirrotta began to make substantial contributions to the scholarly literature on the music of the Italian Renaissance, complementing the earlier publications on the music of the Trecento and seventeenth-century opera. The particular achievement of the retirement years was a series of articles on eighteenth- and nineteenth-century Italian opera. What is notable about these writings is the broad and deep contextualization of important developments in operatic history. One had assumed that one was reasonably familiar with Beaumarchais’s spoken comedies Le mariage de Figaro and Le barbier de Séville and Mozart’s and Rossini’s operatic masterpieces based on them, but Pirrotta’s article on Beaumarchais situates various elements of the plots and music of both musical masterpieces within the long history of Italian comic opera, illuminating their composers’ use of compositional convention and providing fresh understanding of age-old practices in the comic tradition. We now apprehend Mozart’s Figaro and Rossini’s Barbiere not only as singular masterpieces but also as the products of decades—of operatic compositional practice. ... Although Pirrotta would never give the development of Italian opera per se the kind of systematic monographic treatment that he lavished upon the pre-operatic theatrical uses of music in Li due Orfei (1970, Eng. as Music and Theater from Poliziano to Monteverdi, 1982; winner of 1970 Otto Kinkeldey Award), his many articles on post-1600 opera, when read as a group, furnish a panoramic account of the evolution of the genre from its beginnings until 1800, and even beyond. Fans of spiffy Internet sites will enjoy Opening the Geese Book, a collaborative project involving the Pierpont Morgan Library in New York, where the two-volume manuscript is housed (US-NYpm M. 905); directors Volker Schier and Corine Schleif at the Arizona Center for Medieval and Renaissance Studies, Arizona State University; and impressive lists of international participants and patrons. The site presents all 1,120 pages of the manuscript in full-color facsimile with unrestricted access, amplified by selected chants recorded by the Schola Hungarica, videos with background information and critical commentary in English and German, a codicological report, archival sources, and bibliography. 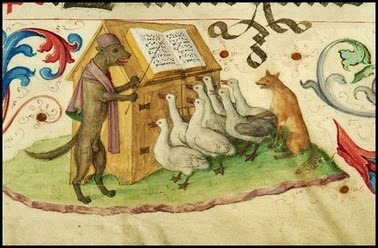 The lavishly and whimsically illuminated manuscript known as the Geese Book is a Gradual produced in Nuremberg, Germany between 1503 and 1510. It preserves the complete mass liturgy compiled for the church of St. Lorenz and used until the Reformation was introduced in the city in 1525. In 1952 the parish of St. Lorenz presented the book to Rush Kress for “the American people,” out of gratitude for the support of the Samuel H. Kress Foundation in rebuilding the church after the destruction of World War II. In 1962 the manuscript assumed its place in the Pierpont Morgan Library in New York, where it remains today—the largest book in this famous collection. Vol. II, fol. 94r shows the Alleluia O Sebalde, from the Mass for Saint Sebaldus sung at St. Lorenz each 19 August)—beginning with the last syllable of the first line, -na of verna. Click on the audio bar to hear the Alleluia. 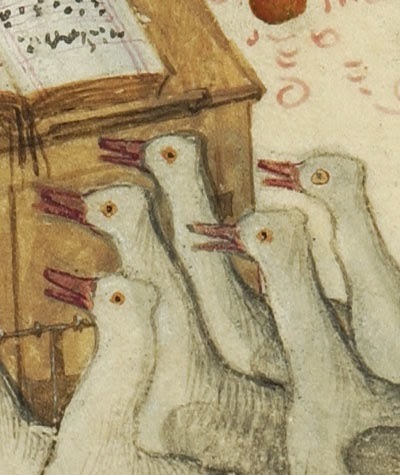 In its digital form the Geese Book can return home to Nuremberg and indeed be available universally, without leaving the protective environment guaranteed by the Morgan Library and its conservators. ... It is hoped that such digital facsimiles with commentaries and sources might come to replace the far more costly printed facsimiles of past generations. Such limited luxury editions could only be purchased by exceptional libraries since copies were priced upwards of $10,000. NOTE: With volume 67, no. 1, the Journal of the American Musicological Society—or JAMS, as it is familiarly known—has implemented new features planned and announced in 2012. The two most significant innovations are the new Digital and Multimedia Scholarship section (reviews and reports on scholarly work in these areas) and enhancements to the online version that include audio and video clips, color images, etc. 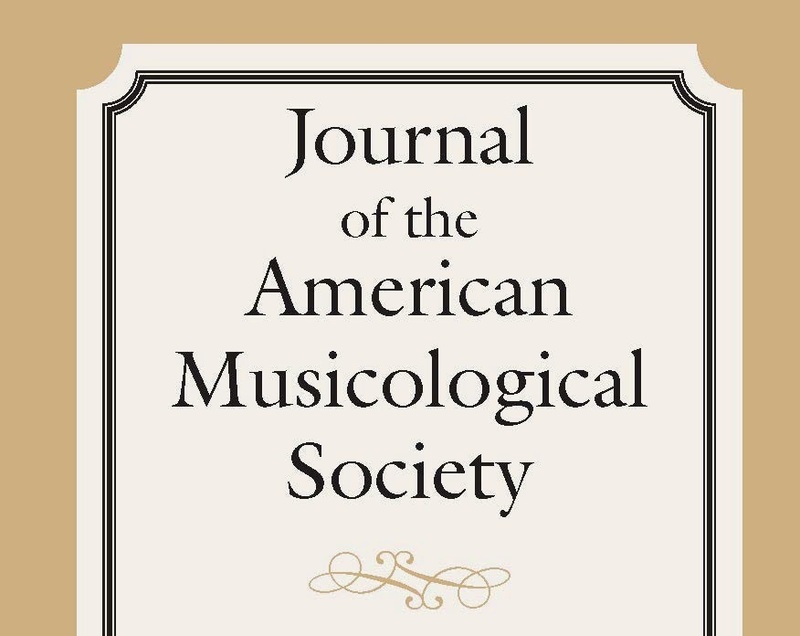 Subscriptions to the Journal of the American Musicological Society are included with AMS membership; the online version is available through JSTOR. Here is the table of contents of the new issue, followed by abstracts of the four articles. The issue will be mailed and published to JSTOR soon. Return here in the near future for a preview of the new features. Given the fragmentary evidence about the emergence of Western plainsong, scholars have not reached a consensus about how early liturgical chant was transformed into fully formed Medieval repertories. Proposed explanations have centered on the Roman liturgy and its two chant dialects, Gregorian and Old Roman. The Old Hispanic (or Mozarabic) chant can yield new insights into how and why the creators of early repertories selected and altered biblical texts, set them to specific kinds of music, and assigned them to festivals. I explore these questions from the perspective of the Old Hispanic sacrificia, or offertory chants. Specific traditions of Iberian biblical exegesis were central to the meaning and formation of these chants, guiding their compilers’ choice and alteration of biblical sources. Their textual characteristics and liturgical structure call for a reassessment of the theories that have been proposed about the origins of Roman chant. Although the sacrificia exhibit ample signs of liturgical planning, such as thematically proper chants with unique liturgical assignments, the processes that produced this repertory were both less linear and more varied than those envisaged for Roman chant. Finally, the sacrificia shed new light on the relationship between words and music in pre-Carolingian chant, showing that the cantors shaped the melodies according to textual syntax and meaning. Beethoven’s treatments of the Russian folksongs in the “Razumovsky” String Quartets, Op. 59, nos. 1 and 2, have long elicited sharp criticism. A closer look at these treatments allows for a reappraisal of the quartets and the circumstances of their commission. Beethoven’s setting of “Ah, Whether It’s My Luck, Such Luck” (Opus 59, no. 1/fourth mvt.) juxtaposes folk and learned styles in ways that complicate the traditional relationship between “nature” and “artifice.” His quasi-fugal treatment of the famous “Slava” tune (Opus 59, no. 2/third mvt.) engages this relationship from the perspective of self-conscious critique. 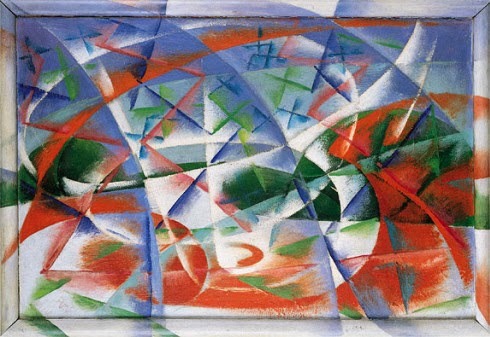 Both settings recall the “synthetic” approach to art championed by Herder; they also evince a cosmopolitan aesthetic with wider cultural and political implications. The settings seem especially designed to appeal to the quartets’ dedicatee, Count Andrey Razumovsky, a European Russian whose intense interest in serious music has been understated. These conclusions are brought to bear on Opus 59, no. 3, the only quartet in the opus lacking a labeled thème russe. Rather than returning to the Lvov-Pratsch Collection (1790/1806) for material, Beethoven appears to have incorporated a Russian folksong from a German source in the Andante’s main theme. The movement fulfills in an unexpected way his pledge to weave Russian melodies into all three quartets. Elizabeth Taylor Greenfield was first in a lineage of African American women vocalists to earn national and international acclaim. Born into slavery in Mississippi, she grew up in Philadelphia and launched her first North American concert tour from upstate New York in 1851. Hailed as the “Black Swan” by newspapermen involved in her debut, the soubriquet prefigured a complicated reception of her musical performances. As an African American musician with slavery in her past, she sang what many Americans understood to be “white” music (opera arias, sentimental parlor song, ballads of British Isles, and hymns) from the stages graced by touring European prima donnas on other nights, with ability to sing in a low vocal range that some heard as more typical of men than women. As reviewers and audiences combined fragments of her biography with firsthand experiences of her concerts, they struggled to make the “Black Swan” sobriquet meaningful and the transgressions she represented understandable. Greenfield’s musical performances, along with audience expectations and the processes of patronage, management, and newspaper discourse complicated perceived cultural boundaries of race, gender, and class. The implications of E. T. Greenfield’s story for antebellum cultural politics and for later generations of singers are profound. Scholarly opinion has for many years been divided over Gunther Schuller’s landmark 1958 article, “Sonny Rollins and the Challenge of Thematic Improvisation.” Jazz theorists view the article’s close analysis of Rollins’s 1956 jazz saxophone improvisation “Blue 7” as one of their discipline’s founding statements; historians and ethnomusicologists meanwhile tend to fault it for neglecting cultural context. In either instance the specific details of Schuller’s analysis have been largely accepted as being internally consistent. The present study proposes that the analysis of jazz improvisation ought to engage more extensively with broader stylistic issues in addition to the specifics of isolated individual performances. Such a musically contextualized perspective reveals that Schuller’s principal argument—that, in this particular improvisation, Rollins developed motivic elements of a composed theme—is false. “Blue 7” was in fact improvised in its entirety, and the melodic pattern that Schuller cited as a thematic motive was one of Rollins’s habitual improvisational formulas, heard on many of the saxophonist’s other 1950s recordings. This canonic recording, as well as the notion of Rollins as a “thematic” improviser, therefore needs to be reconsidered.